We have shown tremendous growth and we are offering a complete range of Laboratory Ovens, Lab Ovens, Industrial Ovens and Hot Air Ovens. Our product range is highly desired by customers as these are double-walled, with inner SS and outer MS, powder coated, along with appropriate glass wool insulation. Our products are delivered within given time limits. The temperature is controlled by a capillary thermostat variable from 5oC above ambient to 250oC with a sensitivity of +/-2 o C.
Air ventilators are provided top at as well as the bottom to ventilate gases and fumes if any. The equipment is provided with a panel which is just below the door having a Capillary type Thermostat, thermostat control known knob, On/Off switch, two pilot lamps and provision for fixing the Timer. It insulated by 3” gap between the walls is filled with special grade wool for proper insulation and to avoid heat losses. 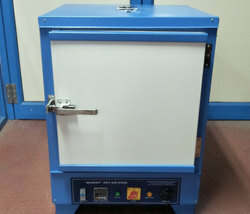 We are a manufacturer, supplier & dealer of Laboratory Oven. 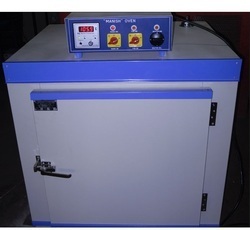 The equipment is provided with a panel which is just below the door having a Capillary type Thermostat, thermostat control is known knob, On/Off switch, two pilot lamps and provision for fixing the Timer. We are counted among the leading manufacturer, exporter and supplier of quality assured Shaking Incubators. Our provided shaking incubators are appreciated by our clients for their compact design, easy installation, strength and longer service life. 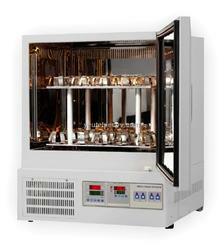 This shaking incubator is demanded cell culturing, bacterial culturing, cell aeration, and metabolism & solubility studies. Also, offered shaking incubator is tested by our quality controllers against diverse parameters so as to dispatch a defect-free range.